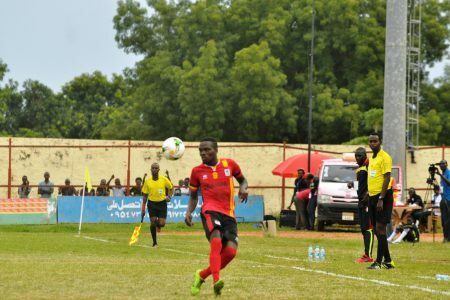 The Uganda U20 National team side, the hippos defeated their South Sudan counterparts 3-0 in Juba to complete a 8-1 aggregate victory in the preliminary round of qualifiers. The 3-0 win came three weeks after the Hippos had defeat South Sudan 5-1 at the StarTimes Stadium in Lugogo. Allan Okello (right) tries to get past a South Sudan defender on Saturday. South Sudan produced another brilliant first half as they refused to be broken in the opening 45 minutes despite not troubling the Hippos either. Vipers SC striker Steven Mukwala scored a double after the restart to take his tally to three in the qualifiers after also getting onto the once in Kampala. The other goal was scored by KCCA FC teenage sensation Allan Okello late on to ensure that the Hippos complete an 8-1 series victory over South Sudan in the two game. The game saw two changes made to the team that started in Kampala as St. Marys Kitende left back Robert Kitabalwa replaced the suspended Mustapha Kiiza and Ivan Eyamu of Kataka FC came in for Proline’s Joshua Okiror. “First of all, i would like to thank each and every Ugandan who prayed and wished us well, said Hippos head coach Matia Lule. “It is good that he game has ended well and we have attained victory on top of the players playing well. “We have won the two legs with a huge margin but the next task that lies ahead is a lot harder and we need not to relax. “We are going to start preparations for Cameroon once we land in Kampala because a expect them to be better than South Sudan. The team was given a token of appreciating by Uganda’s ambassador to South Sudan, Agama Woling Anthony who gave them 300 Dollars after the game. 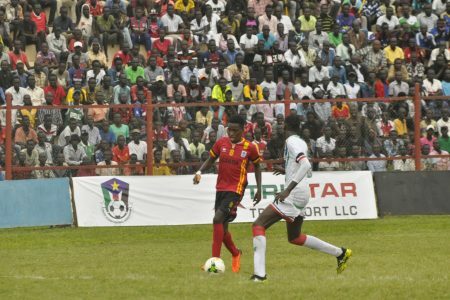 Uganda will take on West African giants Cameroon in the last round of qualification and will play the first match in Yaoundé before finishing off the tie at the StarTimes Stadium in Kampala. They will return on Sunday morning at the Entebbe International Airport and will embark on the preparations for the next game immediately. Saidi Keni (GK), Paul Wila, Robert Katabalwa, Mujuzi Mustafa, Geoffrey Wasswa, Abubakar Kasule, Ivan Eyamu, Julius Poloto (cpt), Allan Okello, Frank Tumwesigye, Steven Mukwala. Denis Otim (GK), Bashir Asiku, Saddam Masereka, Fred Okot, Faizol Ssekyanzi, Herbert Achai.